They’re not all bad. But even a challenging media can’t help. Have you seen this today? Just staggering levels of delusion in the face of clear evidence showing the opposite. It’s a cult, there is simply no reasoning with them. Madness. 🎙“You stand by a statement that's no longer true"
Project Fear? I would have thought this would have been on the main page of the BBC website, but it’s on the Business page. Not good news. They shouldn’t be allowed to get away with this, I thought TV had to be impartial. Shocking. Custom union starting to rear it’s head . But that’s not Brexit. I believe we will have to pay into the EU to be part of it but have no say on how it’s run. It is Brexit cos we won’t be part of the EU. But your other points are valid. Yep, barely making a ripple. which shows how utterly f*cked up the whole thing is. And then the European Banking Agency next month. Project Fact. But it will be batted away by the Brexiteers as rubbish. it's insane. They're insane. Sky News doesn’t have to be impartial. Be thankful for the BBC. Nah - BBC just publish fake news and stoke project fear don’t you know ?! Apologies to the Major - I see he posted similar. £800 Billion, yes billion, has already left the City. Barclays today got permission to move £190 billion. Why does this matter? It’ll have a huge effect on tax revenues...HUGE! Our f***ing politicians are arseholes. I make no apology for my language. We’re being shafted! Never mind the loss in tax revenues think of that money that will be saved by not paying into the EU! This is all ahppeneing and Brexit hasnt happened as yet there will be furhter job losses once it does..maybe not immediately but over the next two years. Even if a "deal" is secured the UK economy will be severely affected....and the working man will be able to relive the "Victorian" experience! *delete non-applicable groups according to your prejudice(s). Edit: Thinking about it aside from the dreaded Illuminati/Lizard people all the other categories you list are pretty well represented. I’ve been to more gay weddings than straight ones over the past decade. Great venues - shite music though! Corbyn? He doesn’t possess anything like the academic qualifications to get anywhere near an interview with the Beeb. It was either Labour leader or council litter-picker for the little tramp. My feet don’t touch the ground. FFS mun, you could have at least kept on topic! 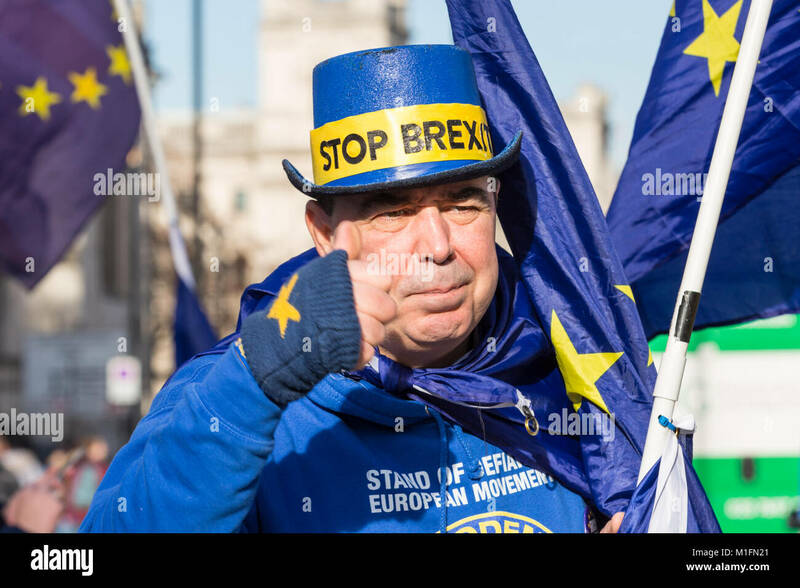 We were talking in work last week funnily enough about the on-going protests outside Parliament, remarking on the fact that the Leave protestors look like somebody you’d be changing next to in the locker rooms whereas the Remainers for the most part look like patients in F Ward at the Bughouse. We do generalise quite a bit, mind. Broad-stroke painters we are. With Steve Bray being from Port Talbot, its more likely you've actually shared the same changing facilities as him. He seems like a well adjusted chap. I'd upgrade to a better gym, pronto. He probably thinks we’re exiting the Eurovision Song Contest. Rolls moves its jet engine design approvals to Germany. To put that into perspective, that's about 8% of the UK's GDP. Assets. Gone. From the UK. To the EU. Yes it does. The Ofcom rules on impartiality apply to all broadcasters. That’s why Fox News was pulled from the Sky platform.